But his was a mind that never stopped questioning and was exquisitely attuned to the pain of the world. Here to relieve the unbearable suspense we left you in after part I are Julia Sherwood and Ottilie Mulzet, picking up where they left off in their chat about Mulzet’s translations from Hungarian and Mongolian, and more! JS: Not all translators take on both fiction and poetry, but you have also translated Szilárd Borbély’s poetry for Asymptote, and your revised and expanded collection of his Berlin-Hamlet came out in the US last year. In what ways is your approach different when translating poetry and prose? And given that in Hungary, Szilárd Borbély was primarily known as a poet, there is a whole treasure trove out there waiting for the English reader—are you planning to tackle any more of his poetry? OM: I’ve actually already translated two other volumes by Borbély: Final Matters: Sequences, and To the Body: Odes and Legends. Final Matters has been described as a monument to his mother, who was murdered by thugs who broke into her home in a tiny village on the night before Christmas Eve, 1999. She was murdered brutally in her bed, Borbély’s father was left for dead but survived. (He passed away in 2006.) Borbély was the one who found them, and well, I don’t think it takes too much imagination to picture the unspeakably deep trauma this must have occasioned. Final Matters is like a three-part memorial to her, although it doesn’t address her murder directly; instead, Borbély employs allegorical language—he drew his inspiration for the first part from central European Baroque folk poetry about Christ and the Virgin Mary, in particular the poetry of Angelus Silesius—to talk about death and the body. There’s a lot of brutally direct detail and philosophical language at the same time. In reading The Dispossessed, though, you see exactly where this comes from—the little boy is confronted with brutal details all day long, but in his own mind, he is preoccupied with abstraction, his love for prime numbers. In the second part of Final Matters, Borbély turns to the myth of Amor and Psyche to explore questions of physicality and immateriality. And in the third part, he reworks another part of Hungarian religious-poetic culture that’s been largely forgotten: the legends and parables of the Hungarian-speaking Szatmár Hassidic Jews from Hungary’s rural northeast. (Now, of course, the Szatmár region is mostly in Romania, and the Szatmár Hassidim, except for the Yiddish-speaking Satmari in Brooklyn, were almost all murdered in the Holocaust.) And yet through these three sections, which he terms ‘Sequences’, he causes the three great western traditions—Judaism, Christianity, and the world of the ancient Greeks—to confront each other, form a dialogue with each other; they all cause the others to be seen in a different light. there where God has ceased to be. The radiant bride, the Sabbath Queen. His vision is very deeply radical: someone once described him as an “ethical rebel.” Like The Dispossessed, these poems are not always easy to read, but for me at least, there is something profoundly salutary in how Borbély never shies away from the hardest questions. In To the Body, he takes up the same questions, but now in a completely different context: the question of the female body exclusively, female suffering, female martyrdom, if you will. Lest anyone think this book condones some kind of woman-as-perpetual-victim narrative, nothing could be further from the truth. In fact, Borbély re-imagines and re-works women’s narratives of birth, death (including the death of their own children), and survival. He speaks in their voice —I think on the whole To the Body is a fascinating example of a man actually writing l’écriture feminine. On one occasion, he expressed to me how he was fascinated by the idea of writing about the lives of modern women in the context of the lives of the medieval female saints—their martyrdom, their agonies. That’s the kind of mind he had—able to juxtapose two things or more that you would never think of juxtaposing. And yet, once you see them next to each other, you realize how much truth emerges as they glance off each other. 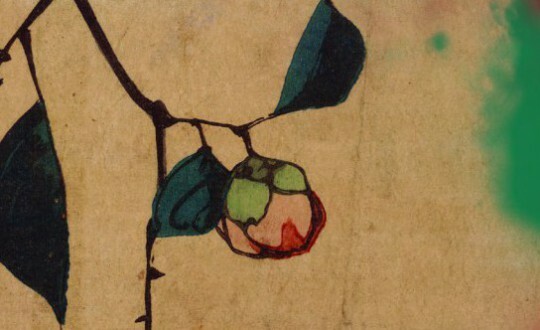 The title is as ambiguous in the original as it is in English, indicating simultaneously what writing is for (for the body), and where our direction is or maybe should be directed (to the body). Some of Borbély’s most challenging philosophical poems are contained in this volume (three poems from To the Body are excerpted here). Borbély was always exploring new subjects. I sometimes think that, had he lived, he would have cast his net even wider, and might have been interested in some of the stories of the refugees attempting to reach safety on Europe’s shores, for example. It’s hard to say. But his was a mind that never stopped questioning and was exquisitely attuned to the pain of the world. In terms of the translations, however, one advantage is that I was able to complete both To the Body and Final Matters while Borbély was still alive. We corresponded a fair bit concerning the English versions, my queries about the Hungarian originals, he read through my final versions and offered his thoughts. 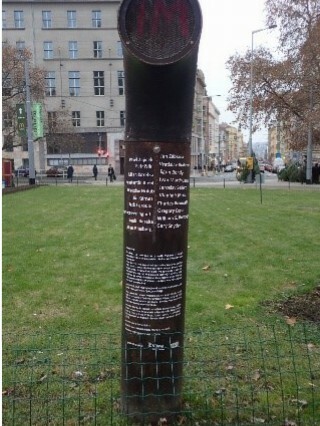 When I began translating in general, I wasn’t planning to work much with poetry, but then I came across Berlin-Hamlet. It’s mainly composed in free verse, so I thought it was well worth a try, and I was so overwhelmed by the beauty and strength of the poems themselves. Then, when Final Matters came along, I was frankly a little wary of attempting rhymed poetry, but I was so bowled over by these poems too that I thought, why not give it a try? You know how it is with rhyming poetry in English, it’s so easy for it to sound like lyrics to a pop song, and I was afraid of creating something that would sound like doggerel. But just as an exercise, I would translate these poems with all the rhymes, trying to stick to the meter and syllable count as much as I could. It’s considered de rigueur to maintain every technical aspect of the original when you translate into Hungarian, and this translation culture has partially influenced poetry translation into English from Hungarian. I found I enjoyed working on these rhyming poems much more than I thought I would, it was like solving a puzzle or a chess problem, especially with the differences in word order. Both morphologically and phonetically, Hungarian is incredibly different from English, so I came to feel that when the technical skeletons of the poems were replicated at the expense of everything else, the poems themselves had gotten a little lost. It’s kind of like the opening lines of Evgeny Onegin, where Nabokov writes that the word at the end of the first line instantly conjures up one hundred other rhymes in the mind of a Russian speaker. Different languages work with different kinds of echoes. So I ended up kind of tracing a middle ground. JS: Despite being linguistically very different, Hungary is firmly embedded in European culture. By comparison, Mongolian culture is little if at all known in the Western world. What attracted you to Mongolian culture and in what ways is it different from the culture of Europe or the US? OM: Oh, that’s a huge question! Personally, I see even enormous differences between the US and Europe… But if I mention what attracted me to Mongolian culture, I would have to say that my first interest in Mongolia was, in fact, linguistic. After spending many years struggling with Hungarian, I felt an inexplicable interest to try to tackle an even harder language. Hungarian, as a language, falls somewhere in between what you would expect from a “Western” language (certain analytic constructions) and an “Eastern” language (back branching sentences, and so forth)—I know to an extent these are absurd generalizations. Linguistically, Mongolian is utterly fascinating, for far more reasons than there probably is space here to enumerate. But, to keep it brief: in addition to the grammar, which is mainly agglutinative but what I would call “nomad agglutinative,” it uses metaphor and metonymy in everyday language in a way I’ve never encountered in any other language. Mongolian has a category of words known as “ideaphones” or “iconopeia” (“picture-painting words”). All languages have these, but Mongolian seems to have a huge amount, and the amazing quality inherent in these words is that they are like visual onomatopoeia, they conjure up an image as opposed to a sound. In terms of culture, I am fascinated by the nomadism, and almost half of all Mongolians living in the territory of Mongolia proper still live a nomadic lifestyle, though there are enormous challenges, primarily in terms of global warming. It’s also an officially Buddhist country, the indigenous roots of which are shamanistic. Of course, Buddhism, as well as shamanism, suffered horrific losses during the communist regime in Mongolia (1921-1990), but ever since the advent of democracy, there have been very strong efforts to revive Buddhism, with monasteries being reopened (most were razed to the ground in the late 1930s), religious ceremonies being revived, and so on. in terms what we expect. JS: Are there any books by Mongolian writers in English translation you would recommend? What are we missing out on and what should definitely be translated into English? Are you planning to translate any Mongolian literature yourself? OM: Actually, my focus thus far has been completely on written versions of the oral literature, namely riddles and Buddhist legends, both in terms of research and translation. There are definitely a number of contemporary authors that should be translated into English. I would recommend the work of Simon Wickham-Smith for a sense of what contemporary Mongolian writing looks like. As for myself, I am embarking on a project of translating contemporary women’s poetry. JS: That’s really interesting and fits in perfectly with my next question, which relates to the huge gender disparity in books translated into English. Highlighted by the VIDA counts this has spawned a whole movement, #womenintranslation, and led to Meytal Radzinski’s initiative of designating August as Women in Translation Month. The situation is quite similar, if not worse, in the Czech Republic: even though a huge number of exciting books by contemporary women writers is being published, women tend to be woefully underrepresented at major literary events. Om: Yes—to take one of the most high-profile events, the Prague Writers’ Festival, very heavily discriminates in favour of male writers. For example, in this past year’s Festival, out of six writers featured only one was a woman. The poster featured a young woman, provocatively posed, offering her décolletage to the viewer—a clear visual quotation of Marilyn Monroe. 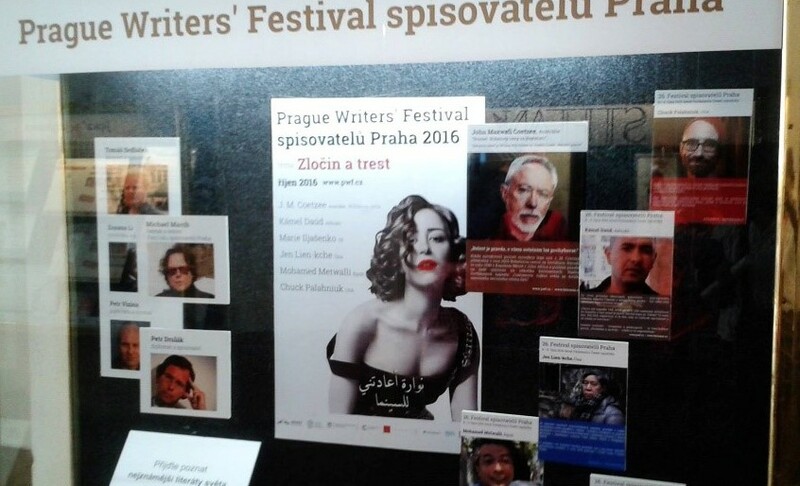 While it was definitely heartening to see writers from outside of Europe featured this past year—an incredibly welcome development, especially for a festival taking place in Prague—the fact that the PWF seems to exist in a strangely archaic, mid-20th-century realm where women are little more than attractive muses for masculine creative energy is very discouraging. I don’t mean to single out only the PWF—generally in the Czech Republic and Hungary as well, the idea of promoting ‘gender parity’ in the literary world doesn’t seem to be too much of a burning issue, to put it mildly. It’s hard to know what to say about this, because often I have the impression that once I start speaking out, I’m perceived as the aggressive western feminist attempting to impose a set of “external” values; or someone who doesn’t fully appreciate the difficult circumstances under which art and writing (and literary festivals) are all too often created in this part of the world. But I would answer that in societies like these, which have struggled so intensely and so long for equity with the West, equity must always include recognition of the need for gender parity. And well as long as we’re talking about examples here, you can see, in the picture below, a lovely invention, a Poesiemat (or Poetry Periscope), which describes itself as “a jukebox with poetry.” You press the button and it plays the voice of the poet or someone else reading one of his poems. Every time I walk by it, someone has been listening to a poem. Utterly charming and delightful—and not one woman poet in sight. Of course, we know all too well we have a long way to go in the West as well. JS: In addition to your translation work and your knowledge of an unusual range of languages, you have also published a number of in-depth literary reviews, of translated books in particular, and have been one of the judges in the translation competition Asymptote held last year. How do you see the relationship between your roles of critic and translator? OM: When I translate something, I’m always thinking about it on a “literary critic” level as well. I guess there’s no way to completely stop that train of thought, and my studies in literary criticism predate my involvement as a translator … I often scribble notes to myself in a separate notebook while I’m translating. One part of my brain is working as a translator, while another is busy analysing the text … all in a day’s work. * Illuminations, Walter Benjamin, trans. Harry Zohn, Schocken Books, NY, p. 134.